You only get one first impression, so having the perfect outfit is the key to a successful job interview. If you look the part, your employers will already be impressed, and will be more likely to see you as the right candidate for the job. The way you dress for an interview says how precise, neat, and professional you really are. If you want to dress to impress and be hired for the job of your dreams, read on. Be as clean as possible. Bad hygiene can ruin the world’s best outfit. It’s absolutely crucial for you take time to have a clean and fresh body before you walk into an interview, or your potential employers will think you’re sloppy and careless. Always shower the day of your interview. Even if you’re busy before the interview, take the time to wash your hair and body as close to the time of the interview as you can. Not only will your skin look clean and fresh, but you’ll feel better because you’ll be more refreshed. Wash your hands right before the interview. It’s likely that the first thing you’ll do when you walk into the interview is shake hands, so it’s important that your hands are clean, smell nice, and aren’t sticky or just plain dirty. Part of good hygiene is smelling great when you walk into your interview. It’s important to smell clean and fresh while not overwhelming your potential employer. Men should avoid heavy cologne or aftershave. Just a light touch will do. 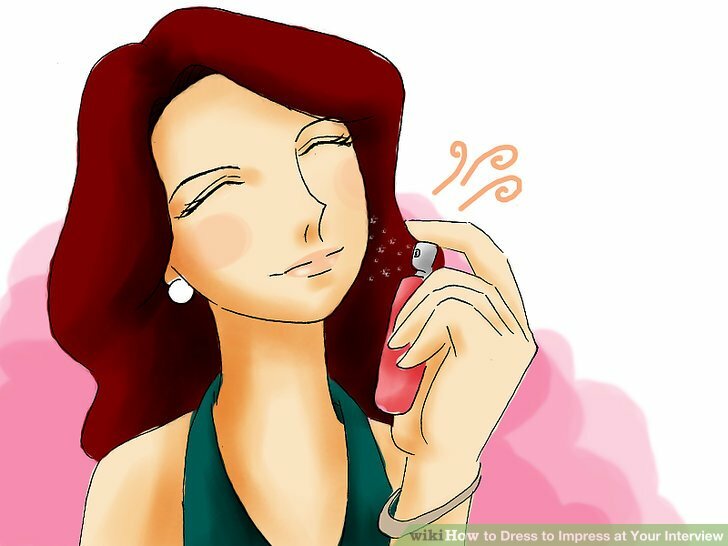 Women can wear a bit of perfume or scented lotion, but should avoid wearing anything with an overpowering smell. Try not to put on perfume right before the interview, or it may smell too strong. Walk into the interview with fresh breath. Avoid sucking on a mint or chewing gum during the interview. Pay attention to your hair. It’s important to show up with clean, well-brushed hair so you look as put-together as possible. 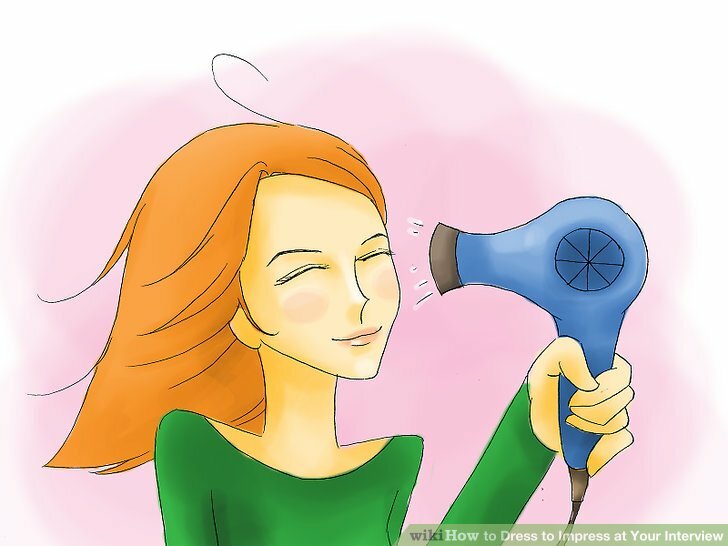 Your hair should be dry and you should avoid any excessive hair products. Have a fresh haircut. If your hair is too long or limp-looking, you may appear sloppy or unprofessional. Men should shave off all facial hair. Have a subtle ‘do. Men should avoid spiking their hair or gelling it in a distracting manner, and women should avoid loud hair-clips or other hair accessories and wear their hair down. Before your interview, check your shoulders for dandruff, especially if you’re wearing a dark color. Your employers will notice your hands as soon as you give them that first handshake, so you should have job-ready fingernails at all times. The way you take care of your nails can show your employers whether or not you pay keen attention to detail. Check under your fingernails to avoid dirt. Women should manicure their nails. They can be clear or a subtle shade of pink, but loud colors should be avoided. Men should trim their nails so they have nice, even edges. Dress for a professional environment. For men, professional attire includes a dark-colored suit, long-sleeved shirt, formal shoes, and a briefcase. For women, professional attire includes a suit, a suit with skirt and pantyhose, and conservative shoes. Remember to know how the people at the company dress–and then kick it up a notch. It’s better to look overdressed than under-dressed. If you’re really unsure about how to dress, ask the person scheduling the interview. Dress for a business casual environment. For men, cotton or khaki pants and cotton long-sleeved shirts or sweaters are appropriate. For women, corduroy or khaki pants or skirts, sweaters, and cardigans are appropriate. If you’re unsure about whether to dress business casual or professional, err on the side of caution and dress professionally. Dress for a casual environment. For men, a clean and simple pair of khakis and a nice button-down short sleeved shirt will work. For women, a nice top and simple skirt will do. Even if the company dress is casual, you can opt for business casual so you don’t look like you’re too relaxed for the interview. To give the right impression, men should have a clean, simple, well-ironed top. 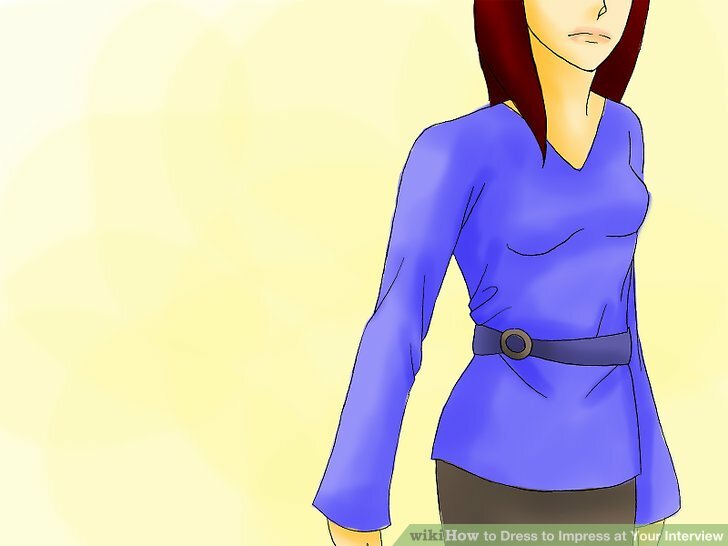 Having a top that fits well over the shoulders, is long enough in the sleeves and torso, and is free of stains or wrinkles is the key to success. 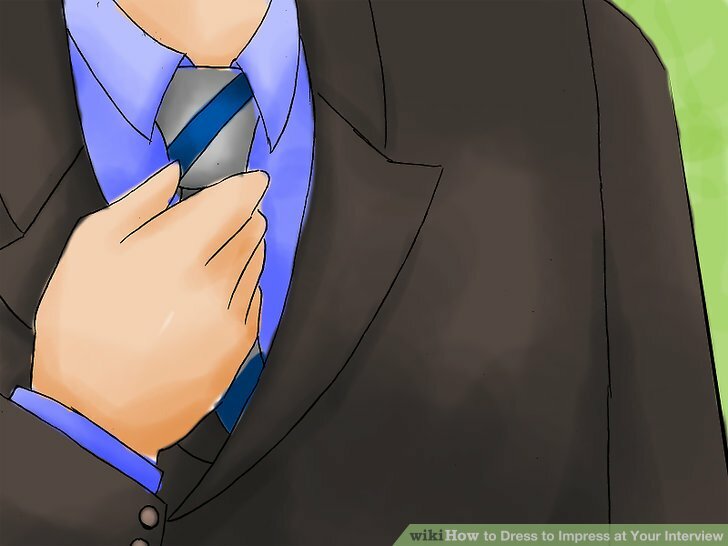 For a professional environment, wear a solid color suit top, long-sleeved shirt, and matching tie. Avoid a tie that is too goofy or loud and pick a subtle, simple color, or a quiet pattern. For a business casual environment, try a khaki top, a sweater, or a well-ironed, short sleeved button-down shirt. Your tie should still be professional, but you can pick a more fun color or pattern. 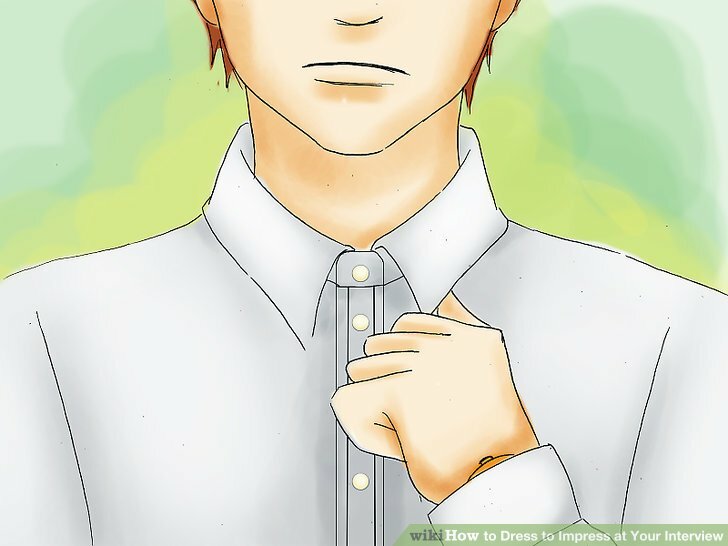 For a casual environment, a well-fitting cotton shirt will do, but don’t wear your favorite t-shirt. Avoid necklaces or jewelry for any environment. This will make you look too flashy. Have the right pair of pants. For a professional or business casual environment, your pants should match your suit top or sweater. 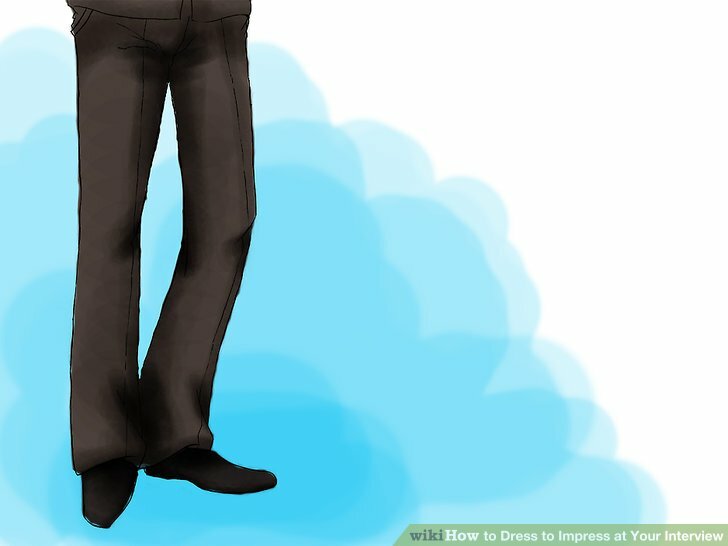 Make sure your pants are well-ironed and are the right length and size. Your ankles should not peek out under your pants. Avoid wearing jeans, even if you’re dressing for a casual work environment. You can wear jeans when you’re actually hired. Avoid shorts at all costs. You’ll look like you’re on vacation instead of a job interview. Have the perfect pair of shoes. Wear shoes that are shiny, clean, and preferably new. Make sure your shoes match the rest of your outfit. 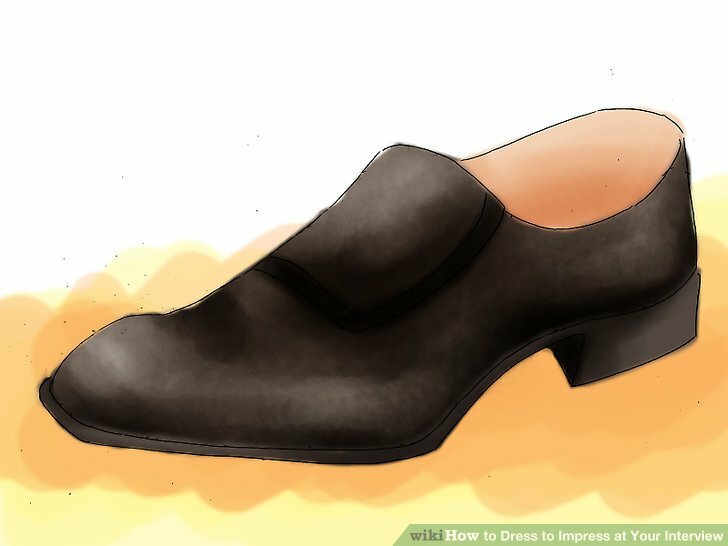 For a professional environment, wear shoes that are a solid color, preferably black or brown. Leather business shoes or classic loafers are the safest bet. Have shoes appropriate to the culture. You can wear more casual wingtips to a casual interview, but avoid wearing flip flops at all costs. Wear subtle socks. Your socks should be a solid color and preferably dark or otherwise just coordinated, matching either your pants, shoes or dress shirt. They should be high enough to cover your ankles when you sit or cross your legs. 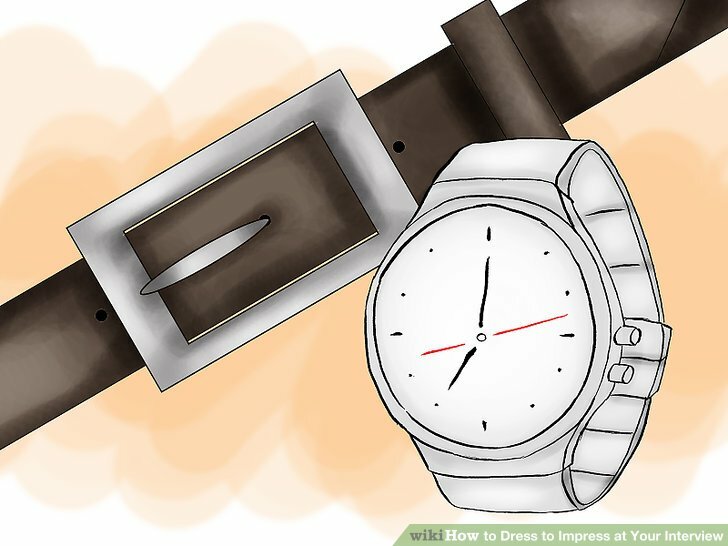 Wear a nice gold or silver watch. Make sure it’s tasteful and not too flashy. A solid-color leather belt with a silver buckle will tie your outfit together. Don’t go without one. A portfolio or briefcase. Even if you don’t need one to give your interviewers writing samples or any other information, bringing a portfolio or briefcase will show that you’re ready for work. 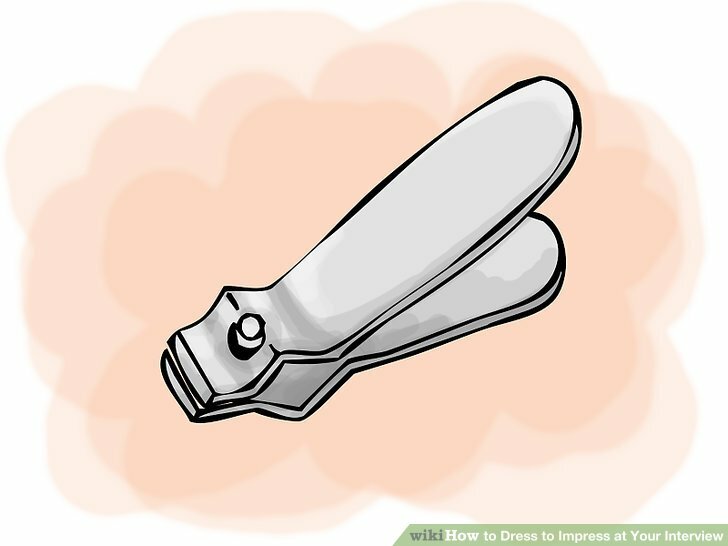 You can skip these for a more casual interview, especially if you’re interviewing for a position that won’t require you to ever use a briefcase. Wear nice and subtle eye makeup. Wear dark eyeliner, subtle eye shadow, and black mascara to show your employers that you spend time on your appearance. Wear a subtle shade of lipstick. Avoid wearing too much makeup. 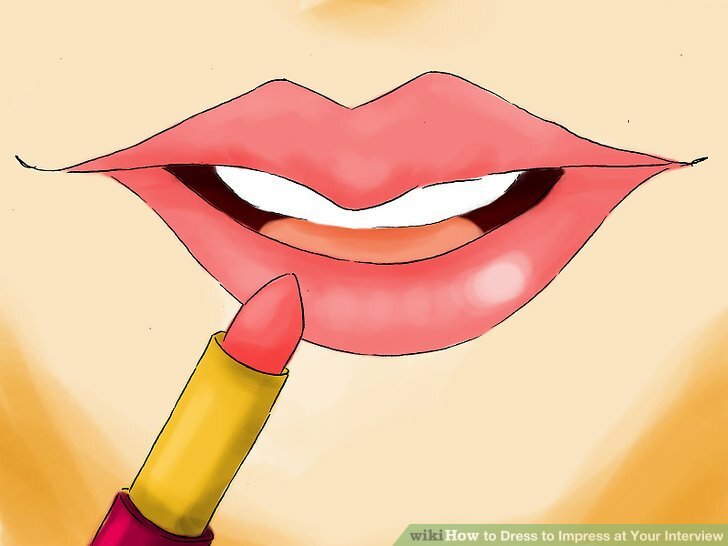 Wear just enough makeup to make a pleasant impression, but avoid hot pink lipstick, globs of blush, or bright green eye shadow. You should look like you’re going to work, not hitting up the clubs. 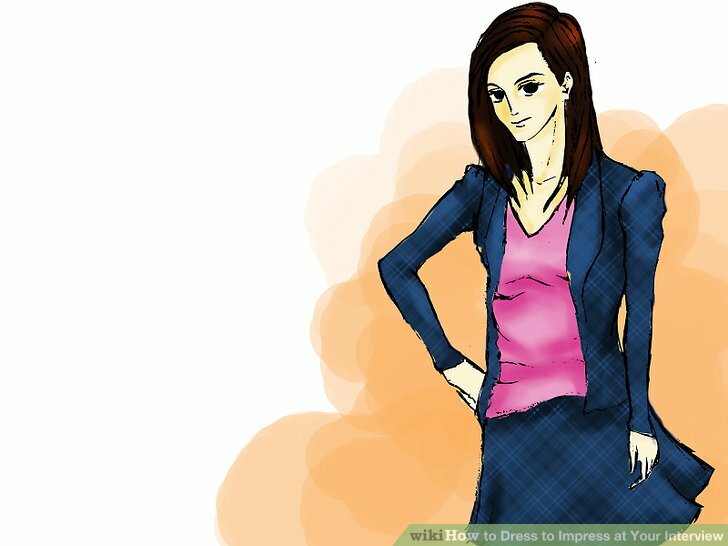 For a professional environment, wear a suit top or a coordinated blouse. Your top should be blue or black. 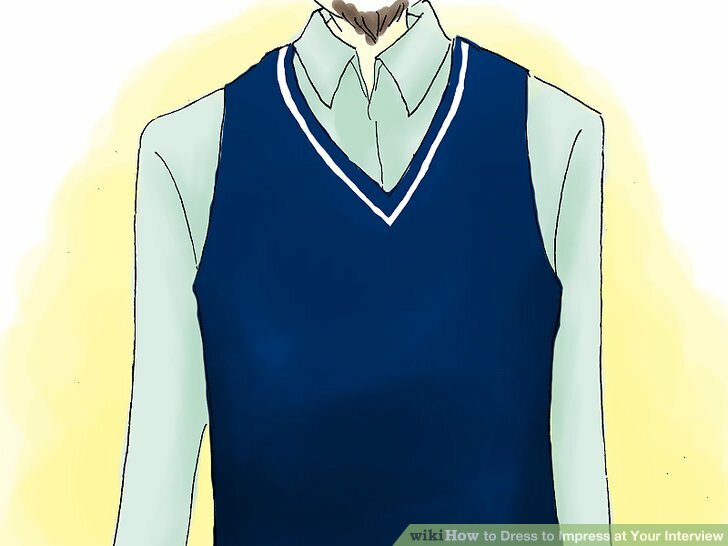 For a business casual or even a casual environment, wear a nice sweater or cardigan. Do not show cleavage. Unless you’re applying for a job where your looks are obviously an important factor, minimize the cleavage as much as possible. Your employers will be too busy staring at your chest to listen to what you have to say, and you will just look silly and tacky. Even if you’re applying to work in casual environment, your assets will not be an asset. Do not wear a see-through shirt. Your potential employers are not interested in getting a peek at your belly button, bra, or chest. Even your bra straps should be covered at all times. Wear the perfect skirt; a black or navy-blue pencil skirt is ideal, coming just down to your knees. For a professional environment, wear a matching suit bottom or skirt. For a business casual or casual environment, a cotton or khaki skirt will be acceptable. No matter what material your skirt is made up, it should be long enough for you to sit comfortably and cover yourself. 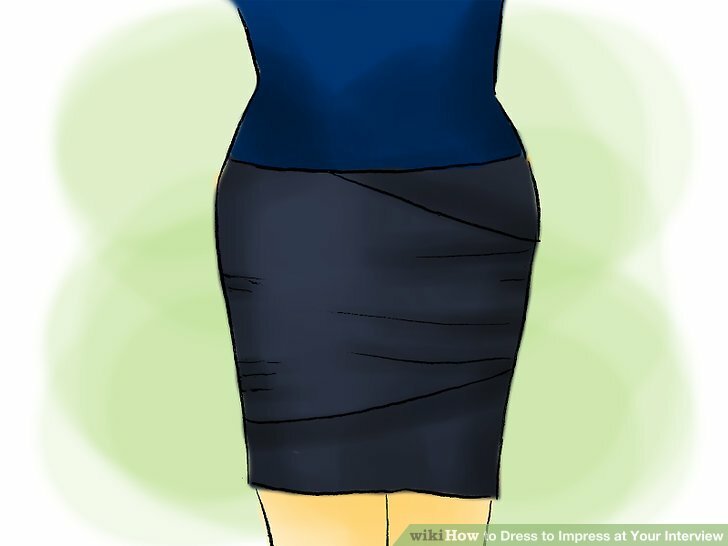 Avoid awkwardly pulling down your skirt during the interview. If you wear a slip under your skirt make sure it won’t show. Wear neutral pantyhose. Avoid fishnets or fun-colored or trendy tights. You will look tacky. Remember that pantyhose can tear easily and bring an extra pair of hose in your purse just in case yours rip on the way to the interview. Nothing will distract your interviewers quicker than a giant run in your hose. The right shoes can tie your outfit together. Your interviewers will notice your feet when you’re sitting down, so it’s important to have the right look. 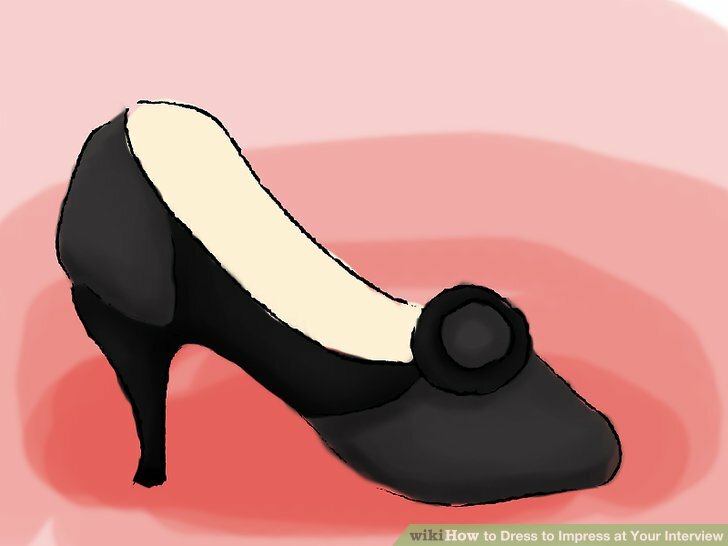 Wear a pair of shoes that are one solid color, preferably black. Have nice reasonably-high heels. Don’t wear platforms or stilettos. Make sure you’re walking in them before you go into the interview. Check that your heels aren’t worn down or don’t have dirt clinging to the bottom. Wear tasteful and subtle jewelry. A quiet silver necklace, ring, or bracelet can help your classy look. Avoid wearing too much jewelry or you’ll look weighed down or like you’re trying to hard to be trendy. Don’t wear more than one ring or bracelet. Avoid showing too many piercings. Even if your ears are pierced eight times, just one pair of earrings will do. Take out your nose ring if you have one. Bring a simple portfolio or briefcase. Show that you’re work-ready even if you don’t need your portfolio that day. 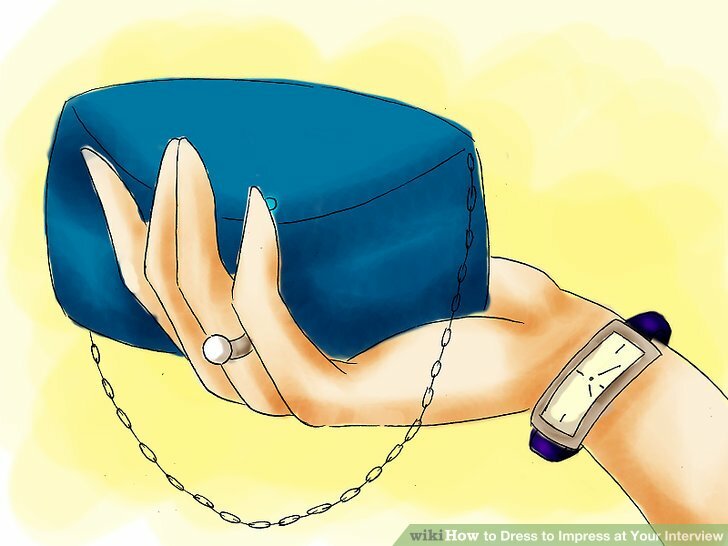 For a more casual environment, a nice one-colored purse will do.